How do you capture and sustain the interest of a potential customer in the age of information overload? As consumers, all of our devices – from TV and tablet to PC and smartphone – are awash with blatantly promotional messaging. Most of us have now developed an inner filter. We know what genuine content looks like, and have ways of avoiding the rest, by skipping YouTube adverts, installing adblock apps and fast-forwarding TV ads on our Sky or Tivo boxes. So how does a business break through these filters to promote itself? 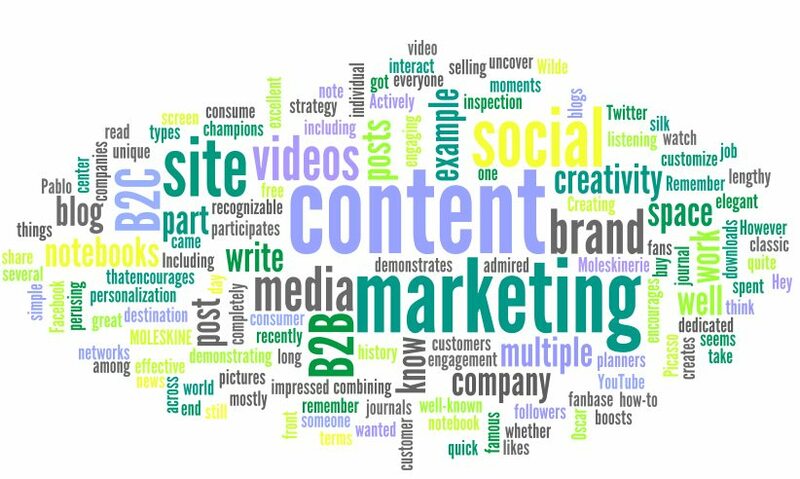 To give you an idea, some examples of content marketing include e-books, video tutorials, audio resources, webcasts, podcasts, forums, blogs and events. OK – so, producing resources does require a bit of time and effort, but the benefit is that people will be given the opportunity to engage with your business in a deeper and longer-lasting way. According to Demand Metric, though, content marketing costs 62% less than traditional marketing and generates about three times as many leads. If you’re thinking of taking the plunge and trying some of these methods yourself, here are some tips to producing content that will get you noticed, and help you build a loyal following! You may already have a good idea of who your target audience is and what their needs are. Evaluating your web traffic and social media engagement is a good way to do your own market research. Think quality, not quantity. You’re not just looking for the amount of casual likes and page visits, but how fully your audience is responding. Try to get a feel of what is important to your followers, and what their wider interests are. Have this in mind when you are creating content. Content marketing is not just one long sales pitch. We’ve all seen those infomercials that tell you in detail what is wrong with your life before, right at the end, suggesting a product as a remedy. Buyers will sniff this out immediately. Remember that this is a golden opportunity to develop your brand tone of voice, beyond the 140 characters of Twitter. Let them know what you’re all about! We know that attention spans can be short online, and several pages of text can be off-putting. But remember that memorable content does not have to be long. Instead, you can share something substantial in the form of a short video or blog post. Give them a tip or a piece of advice – something which they can try doing themselves, using one of your resources. This is empowering and feels more natural than suggesting there is product they cannot live without. Webinars and Twitter chats can allow you to answer questions and interact with your customer base in real time. Forums and Facebook discussion groups are a way of allowing the audience to build itself. By paying attention to these forums, you can pick out the frequently asked questions, talking points and key interests of your audience. Also, don’t forget events! Public speaking and interaction are a great way to build rapport. You may like to reserve exclusive digital content for those who attend your event! Social media is becoming more commercially-oriented, with users having to change their settings to ensure they are seeing what matters to them. So encouraging subscription has never been more important. YouTube Channels and email newsletters are great places to starts. Producing genuinely interesting, useful content will ensure your message is getting through and not going straight to junk mail. Have you thought about featuring an expert guest-bloggers or interviewees? This can be time-saving and give your content an extra bit of cachet. Do your research and find guests who would appeal to your audience. Sometimes a fee might be attached, but contra deals are great way of reaching each others’ audience. So where does the buyer go next? Where do they find similar content? How do they explore the topic in-depth? Having relevant web-links, preferably to your own content, is a good starting point. A lot of websites will now automatically generate those links underneath an article. Make sure your content does not just sit on your website, gathering dust. Share it on social media or try putting promotional codes on printed marketing materials, encouraging people to go online. Another idea would be to film events and post them to your website and social media channels. You might have a very compelling message, but if your design is not up to scratch, few people will take notice. Ensure that your online and offline marketing content has consistent branding which looks professional and sums up what you stand for. As you can see, marketing in this way can be not only be creatively fulfilling, it can also help you to form a deeper connection to your buyers!